Bishop Cynthia Fierro Harvey addresses the United Methodist Judicial Council meeting in Zurich. Photo by Diane Degnan, UMCom. Anxious church commentators are wondering if the latest development in the lead-up to the special called General Conference in February 2019 means the Traditional Plan is fatally flawed. In a comprehensive 58-page ruling released October 26, the Judicial Council has rendered its opinion on whether the One Church Plan, the Connectional Conference Plan, and the Traditional Plan are constitutional and in conformity with other parts of the United Methodist Book of Discipline. The short answer is that the Traditional Plan is alive and, while a bit broken, can be fixed. (The Traditional Plan would retain the current position of the church on marriage and human sexuality, enhance accountability, and provide a gracious exit for those who cannot live within the church’s expectations.) The One Church Plan, also described as the “local option,” survived scrutiny with a few of its minor provisions ruled unconstitutional. The Judicial Council declined to evaluate the Connectional Conference Plan, since the Book of Discipline does not allow the Council to evaluate proposed constitutional amendments, which are an integral part of the plan. Evaluating the Traditional Plan. It is not surprising that the Judicial Council found a greater number of problems with the Traditional Plan (TP) petitions. Because the Council of Bishops instructed the Commission on a Way Forward not to develop the details of the TP, it did not receive the same amount of attention and vetting that the One Church Plan and Connectional Conference Plan received. The Judicial Council’s work, therefore, is a blessing to help refine and perfect the TP. The Judicial Council’s problem with these petitions was because the requirement focused on certain provisions of the Discipline to the exclusion of others. “The certification is incomplete and selective because it relates to some but not all applicable standards of The Discipline and targets one particular group of candidates for disqualification” (p. 35). This problem can be corrected with a simple language change clarifying that upholding of the whole Discipline is required, not just certain parts to the exclusion of others. The other aspects of the Traditional Plan were upheld (see the description elsewhere in this issue). Evaluating the One Church Plan. The One Church Plan (OCP) was largely held to be constitutional. Several provisions meant to give greater protection to a traditionalist viewpoint were struck down for various reasons. Some could probably be salvaged by changes in wording. More significantly, the Judicial Council ruled that the idea of “connectionalism” under which our church operates “permits contextualization and differentiation on account of geographical, social, and cultural variations and makes room for diversity of beliefs and theological perspectives but does not require uniformity of moral-ethical standards regarding ordination, marriage, and human sexuality” (p. 1). The idea that the church could establish moral or ethical standards that are different from one place to another strikes me as unbiblical. Standards for right and wrong should not vary from one country or culture to another. Lying is always wrong, except perhaps to save a life. Adultery is always wrong. Fortunately, the Judicial Council was only ruling on what is legal, not on what the church ought to do. The General Conference can and should still defeat the One Church Plan and preserve a more robust sense of connectionalism founded on our common relationship with Jesus Christ, our adherence to biblical teaching, and our shared understanding of doctrine. 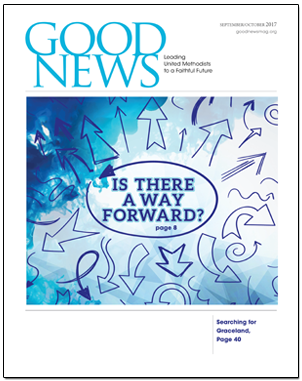 Anything less will lead to a splintering of the church..
Thomas Lambrecht is a United Methodist clergyperson and the vice president of Good News. He was also a member of the Commission on a Way Forward. 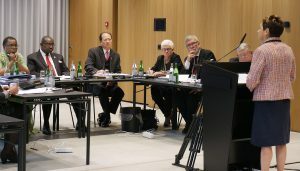 In his role as a Commission member, he was also tasked to present the case for the Traditional Plan before the Judicial Council in Switzerland. Thank you for the insight, but that is a lot of moving parts for the rank-and-file to comprehend, clergy and laity alike. What is most bothersome to me is that even the TP sounds like a departure from the status quo. I think regardless of the outcome, the bleeding will continue overall because Methodist disciples do not want to have to deal with the politics of the UMC. Being a United Methodist disciple should not come to mean being politically astute. I might not understand all of this language or exactly what all this means of the different plans, but I do know what the God breathed bible says as I hope you also know. Rev. 22: 14-20. Deut.4:2. I also know my giving of money and time will worship elsewhere. I can’t believe you can’t see Satan’s plan to destroy the Christian life. I’m not judging but remember who will. I just won’t be dragged into your sin. Is that simple enough? Is for me. I like your thinking. God bless you. As a Licensed Local Pastor serving in the Kentucky Conference, I have noticed no mention of us in any of the three plans brought forward. I support the Traditional Plan, but since local pastors seem to float in some gray area between clergy and laity we have no say in any of the decisions until everything is settled. Does anyone know how we fit in all of this?